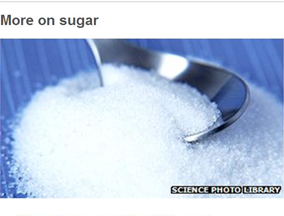 We need to reduce our sugar intake, says a new campaign group. But some foods have a surprisingly high amount of sugar added to them. Action on Sugar has been launched to reduce the amount of sugar added to food and soft drinks. The aim is to help people avoid "hidden sugars" and get manufacturers to reduce how much they use. Some foods have surprisingly high amounts of sugar added to them. Here are five. Fat free doesn't mean sugar free, especially when it comes to yoghurt. It's often laden with sugar to keep flavour and texture when fat is removed. A 150g (5oz) serving of some 0% fat yogurts can contain as much as 20g (0.7oz) of sugar - the equivalent of five teaspoons, says Action on Sugar. That's getting on for half of a woman's daily recommended intake of added sugar, which is 50g (1.7oz). It's 70g (2.5oz) for men. "The problem is people want low-fat food but they want it look and taste like full-fat food," says dietician Dr Sarah Schenker. "To achieve this something else, like sugar, is put in when the fat is removed. If people want healthier food they need to accept it might look and taste a bit different." Is this the ultimate healthy meal? Is there any point giving things up for January? A tomato-based pasta sauce boasts certain health benefits, but a shop-bought one can also be packed with sugar. It's often added to make the sauce taste less acidic. A third of an average-sized jar, roughly 150g (5oz), can contain over over 13g (0.5oz) of sugar. That's nearly four teaspoons of sugar. And while coleslaw is mostly shredded vegetables, it also comes with an added serving of sugar. The mayonnaise is largely to blame. 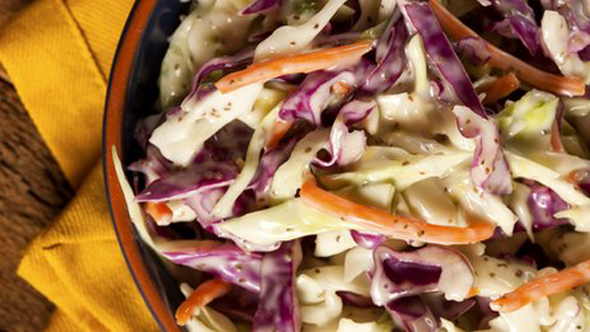 One tablespoon of a shop-bought coleslaw, roughly 50g (1.7oz), can contain up to 4g (0.14oz) of sugar. A couple of spoonfuls on your plate is equivalent to a couple of teaspoons of sugar. "Sauces are often high in sugar," says Dr Schenker. Water is good, right? Depends what type. "Enhanced water" has vitamins added to it but sugar as well. A 500ml (18fl oz) glass of some brands contains 15g (0.5oz) of sugar, the equivalent of four teaspoons of sugar. Finally, there is the staple of many people's day - bread. The sugar content in the average slice of processed bread varies but can be as high 3g (0.1oz). If a woman has toast for breakfast and a sandwich for lunch she is almost at a quarter of her recommended daily intake for added sugar. "Often savoury does not mean low sugar," says Dr Schenker.